Introduction: There is still a debate how to treat early carcinoma of the esophago-gastric junction. The spectrum ranges from endoscopic procedures to esophageal or gastric resections. Less invasive but with appropiate radicality is the limited resesction as described here. 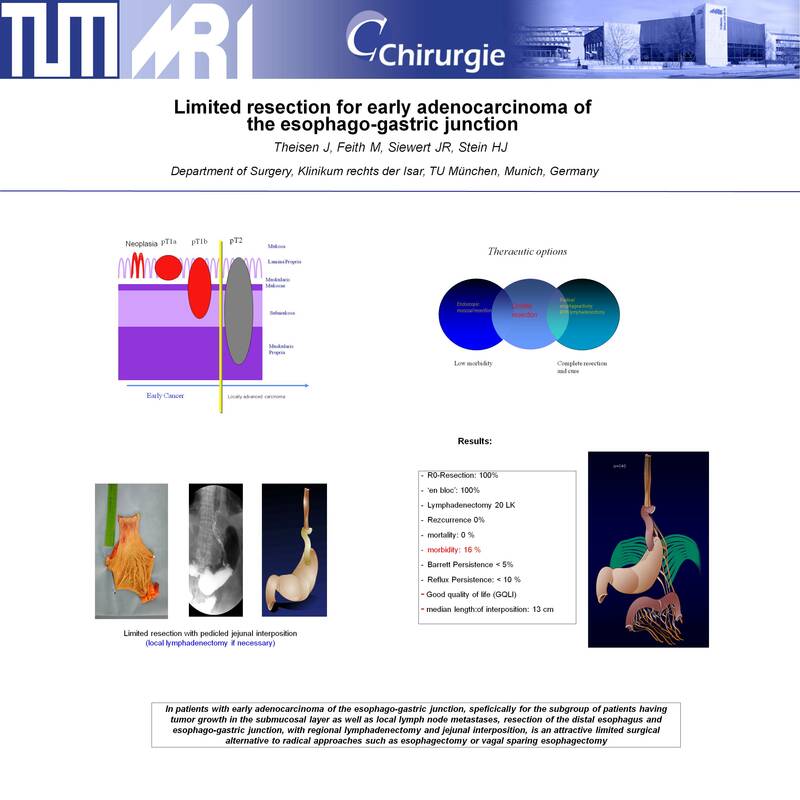 Methods: 134 patients with early carcinomas of the esophago-gastric junction underwent a limited resection of the distal esophagus and esophago-gastric junction, and reconstruction by interposition of a pedicled isoperistaltic jejunal segment. The patients were analysed for extent and multicentricity of primary tumor, the pattern of lymphatic spread, complications, death and outcome of surgical treatment. Results: In more than 60% of the cases multicentric tumor growth could be found in the resection specimen. R0 resection could be achieved in all cases including the entire length of the metaplastic segment. In T1a tumors there were no lymph node metastases, in contrast to app. 20% lymph node metastases in T1b tumors. After a median follow-up of 60 months the Gastrointestinal Quality of Life Index did not differ from that of healthy controls. The lymph node status showed a prognostic impact wheras T1a or T1b did not. Limited resection of the esophago-gastric junction is a safe procedure which has its place within the spectrum of therapeutic option for early cancer of the esophago-gastric junction specifically for the subgroup of patients having tumor growth in the submucosal layer as well as local lymph node metastases.